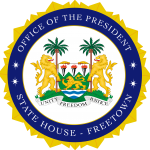 In line with his commitment, during the State Opening of Parliament Address, to setting up a Directorate for Science, Technology, and Innovation, His Excellency President Julius Maada Bio has appointed a new Chief Innovation Officer, Directorate of Science, Technology, and Innovation for the Government of Sierra Leone. President Bio has appointed 31-year-old, Dr. Moinina David Sengeh as the Chief Innovation Officer, Directorate of Science, Technology, and Innovation for the Government of Sierra Leone. The Directorate of Science, Technology, and Innovation will be within the Office of the President but executing its functions through the Office of the Chief Minister. The Directorate will also work closely with the Ministry of Technical and Higher Education to advance scientific research in schools and colleges. The Vision of the Directorate of Science, Technology, and Innovation is to transform Sierra Leone into a prosperous nation through Science, Technology, and Innovation. The Directorate will facilitate and support a vibrant national innovation and entrepreneurial ecosystem for both public and private sectors. Dr. Moinina David Sengeh completed his Ph.D. at the Massachusetts Institute of Technology where he developed award-winning technology for human augmentation. Dr. Sengeh received his bachelor’s degree at Harvard University in Engineering Sciences, where his research focused on aerosolized vaccines for tuberculosis. At the time of his appointment, Dr. Sengeh is currently a Manager at IBM Research Africa, where he leads the healthcare team developing solutions in artificial intelligence and machine learning. He has published several academic articles and holds several patents. Dr. Sengeh is globally recognized for his work and accomplishments: he is a Senior TED Fellow, a National Geographic Emerging Explorer, Forbes 30 Under 30 and most recently, an Obama Foundation Leaders: Africa Fellow. He is credited for seeding the development of the innovation ecosystem in Sierra Leone through Global Minimum and the Innovate Salone program, which he co-founded in 2007 and which has supported the innovation journeys of thousands of young Sierra Leoneans. The appointment of Dr. Moinina David Sengeh has not only demonstrated His Excellency’s commitment to science, technology, and innovation but also his dedication to the empowerment of young people.